When I was a kid, seeing a white streak across the sky was a big deal. You didn’t see many of them. When you did see one, and knew that a jet had been over your house. It was exciting: a jet! Flash forward to today. All of a sudden, the sky starts to look like a spiderweb; white streaks are zig-zagging all over it. Was there a huge increase in jet travel? Did the military quadruple the number of sorties? Did United Airlines have a gigantic increase in flights? And that led some researches to ask an obvious question: what is with all the contrails? If you haven’t heard that term before, let me explain. A contrail is a condensation trail. Condensation is the output of a jet engine; that’s what makes the white trail in the sky after a jet has gone by. A normal contrail evaporates in a few hours and disappears into the blue sky. These new “contrails” don’t disappear, though. Take a look for yourself sometime. Ever see a contrail stay around for days? I have. Ever see a contrail form a cloud? All you have to do is take a careful look; it happens all the time. Researches began to wonder: is someone up to no good? And it didn’t take terribly long to find out that yes, someone is definitely up to no good. And the price is going to be paid, as always, be you and me — Joe Average Citizen. In the world of conspiracy, chemtrails are unique, because they’re hiding in plain sight. Anyone can see them. Just look up. 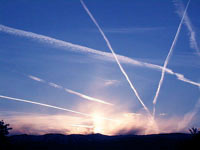 Chemtrails (CTs) look like contrails initially, but are much thicker, extend across the sky and are often laid down in varying patterns of Xs, tick-tack-toe grids, cross-hatched and parallel lines. Instead of quickly dissipating, chemtrails expand and drip feathers and mare s tails. In 30 minutes or less, they open into wispy formations which join together, forming a thin white veil or a “fake cirrus-type cloud” that persists for hours. William Thomas is widely recognized as the man who first reported on Chemtrails. 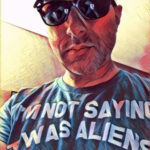 William is an award-winning journalist in Canada, and the author of several mainstream books — this guy is not an attention-grabbing conspiracy-theorist cliché; he’s the real deal. William’s theory (he’d say it’s darned near fact) is that the US government is doing large-scale weather experiments. For evidence, he points out Senate bill S517, signed into law by George W. Bush in 2005, which mandates a Weather Advisory and Research Board whose charter allows them to chemically alter the atmosphere. Chemtrails are weather modification experiments. Evidence US S517, and the universally accepted strange weather experienced by Americans since the 1990s. Chemtrails are a massive biowarfare experiment. A DARPA project called the “Unconventional Pathogen Countermeasures Program” is to blame. The military, perhaps well-meaning, is testing anti-germ sprays on us. Chemtrails are spraying mind-altering drugs on the American public. I know this sounds far-fetched. I would’ve dismissed it myself if it hadn’t been for a bill introduced in the House of Representatives that specifically forbids the government to attempt mind control of its populace via chemtrails. The operation is apparently underway, reportedly with names like Operation Clover Leaf, Operation Red Sky, and Operation Rain Dance. My preference: all of the above. The US government is trying all of these tactics and more. Seriously, would you put it past them?